PHOENIX — The Phoenix Law Enforcement Association (PLEA) held a barbeque fundraiser yesterday, raising money for the defense of their thug homeboy Richard Chrisman. Protesters greeted every cop and anyone else who came to support Chrisman with a serenade of chants, signs, and bullhorns. Watch the report from KTVK Channel 3 in Phoenix, in which yours truly chimes in. The police thug then shot Mr. Rodriguez with a Taser and then shot and killed Mr. Rodriguez’s dog. Rodriguez, who was clearly fearing for his life at this point, tried to get on his bike and ride away from the criminal thug who had illegally entered his home and killed his dog. 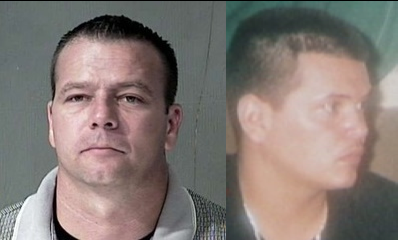 Chrisman fired several shots, killing the 29-year-old Rodriguez instantly. The police thug now faces 2nd degree murder and animal cruelty charges. The killer cop is, of course, free on a miniscule $150,000 bond. We fully expect Chrisman to either be acquitted of all charges or serve less than one year in prison, pursuant to United Police States Of America precedent. The OP-NAT EYE snapped a photo of as many of the cops who attended this disgrace of a display as we could. Each and every one of these people you see in the following slide show supports killer cops. Please beware and be pro-active if you encounter any of these people. If the embedded slideshow does not work, go directly to the Google Archive to see the faces of all the Phoenix cops who came to a fundraiser BBQ to support killer cop Richard Chrisman.